There are lots of different types of screws for doing different jobs. But you'll probably just need to know of a few to get started. The screw head can be slotted or cross head. You'll need to select the the right type and size of screwdriver for the screw. That's why you'll need a set of at least 5 or 6 screwdrivers. Cross head are easier to screw in without the screwdriver slipping than slotted. But slotted tend to look better for decorative finishes, especially if you have fittings with brass or chromed screws. 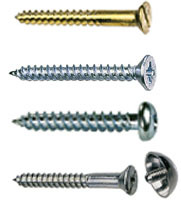 You may also need to think about whether you need exterior screws which will resist rust and corrosion.